Fruit flies live 16% longer than average when given low doses of the mood stabiliser lithium, according to a UCL-led study. 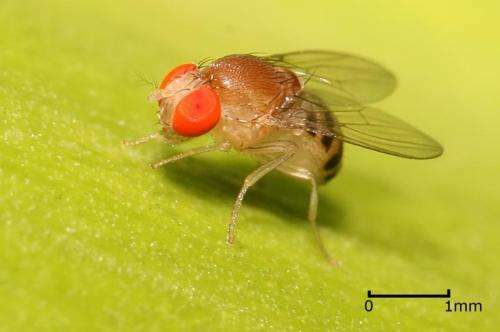 How lithium stabilises mood is poorly understood but when the scientists investigated how it prolongs the lives of flies, they discovered a new drug target that could slow ageing - a molecule called glycogen synthase kinase-3 (GSK-3). "To improve our quality and length of life we must delay the onset of age-related diseases by extending the healthiest period of our lives. Identifying a drug target for ageing is a crucial step in achieving this and by targeting GSK-3, we could discover new ways of controlling the ageing process in mammals, including humans," explained lead researcher, Dr Jorge Iván Castillo-Quan, previously at UCL Institute of Healthy Ageing, now at Harvard Medical School. The team found that lithium delays ageing by blocking GSK-3 and activating another molecule called NRF-2, which is found in worms, flies and mammals (including humans) and is important for defending cells against damage. According to the scientists, GSK-3 could be a target for drugs to control ageing. The study, published today in Cell Reports, shows that male and female flies live longer than average when given low doses of lithium during adulthood or later in life, regardless of their genetic make-up. At low doses, few adverse effects were seen in the flies as they continued to feed normally and produce healthy offspring. Different doses of lithium chloride were given to 160 adult flies to measure the effect on lifespan. Higher doses reduced lifespan but lower doses prolonged life by an average of 16% and maximum of 18% compared to a control group given sodium chloride. The benefits of lithium were also seen when it was used as a transient and one-off treatment. Flies that received a one-off dose near the end of their lives lived a maximum of 13% longer and young flies given low doses of lithium chloride for 15 days before switching to a control for the remainder of their lives also lived longer. "We studied the responses of thousands of flies in different conditions to monitor the effects of lithium and how it extends life. We found low doses not only prolong life but also shield the body from stress and block fat production for flies on a high sugar diet. Low doses also protect against the harmful effects of higher, toxic doses of lithium and other substances such as the pesticide paraquat," said co-author Dr Ivana Bjedov from the UCL Cancer Institute. Principal investigator, Professor Dame Linda Partridge, Director of the UCL Institute of Healthy Ageing and the Max Planck Institute for Biology of Ageing, said: "Our aim is to identify ways to intervene in ageing, with the end goal of keeping us all healthier for longer and compressing the time at the end of life when we suffer from physical decline and diseases. This can be done by diet, genetics or drugs, which is why we want to identify promising drug targets. The response we've seen in flies to low doses of lithium is very encouraging and our next step is to look at targeting GSK-3 in more complex animals with the aim of eventually developing a drug regime to test in humans. More information: 'Lithium promotes longevity through GSK3/NRF2-dependent hormesis' Cell Reports, 2016.